Monitoring coho salmon populations in the Russian River Basin and conducting multiple research projects that support salmon recovery. A typical day could see me conducting a PIT tag wanding survey, or any number of other field activities, on the stream. I could also be analyzing data, writing reports, updating our website or managing any of the myriad logistical tasks required to help this program run smoothly. The first time I saw a pair of adult coho salmon spawning in Green Valley Creek. By then I had been working locally in the field of salmon recovery for close to 15 years, during a period of very low adult returns, and when I saw this spawning pair it made me feel like everything we were working towards might be possible. It was exhilarating! I love the people I work with. Our crew is indefatigable and we share a remarkable sense of teamwork and harmony. Also, my supervisors treat each of us with the utmost respect, creating a positive and productive work environment. I also love that I am never, ever bored. At the end of each day, I look at the clock and find myself upset by the late hour, rather than relieved. From the moment I took my first Environmental Studies course I knew that I wanted to devote my energy toward remediating some of the damage that we humans had inflicted upon the planet. I graduated from Sonoma State University with a degree in Natural Resource Conservation and Restoration and served as an AmeriCorps Watershed Stewards Project volunteer for two years before becoming a Scientific Aide with the California Department of Fish and Wildlife. Ultimately, I served as the Restoration Specialist for CDFW's Russian River Basin Planner's office, where I worked on a collaborative project with UCCE, conducting educational workshops and small-scale restoration with streamside landowners throughout the watershed. In 2001, I moved into a career position with UCCE, where, over the years, I've had the pleasure of working on an impressive diversity of programs under the guidance of the Watershed Program and Marine Advisors. 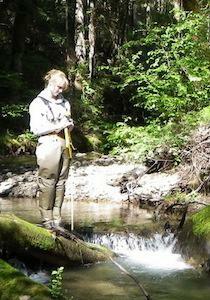 I have been working with the Russian River Coho Salmon Monitoring Program since 2009.